Sell your energy savings ideas in less time with data-driven benchmarking and energy management reports. Uncovering energy savings opportunities and developing successful relationships with decision-makers is key to moving projects forward. But you know that gathering and analyzing utility data is a lengthy, time-consuming task, and the administrative burden takes you away from the activities that matter most. Save time and equip yourself with the right tools to make your recommendations a reality with EnergyPrint’s Qualifying Benchmark Service, powered by Insights Architect™. Using our proprietary industry database, we’ll compare a building’s energy performance to that of similar buildings. Then, we’ll pull it together in a polished, insightful report designed to strengthen your credibility with decision-makers — bringing you one step closer to winning your next energy management improvement project. Our team of utility data professionals customizes Qualifying Benchmark reports to your specific goals — you receive meaningful, data-rich reports that show the value of your projects. We can repeat the process quickly and easily over time. Start with 12+ months of historical utility bill data that we input and validate for each building. Compare the building to our large proprietary database of similar buildings. 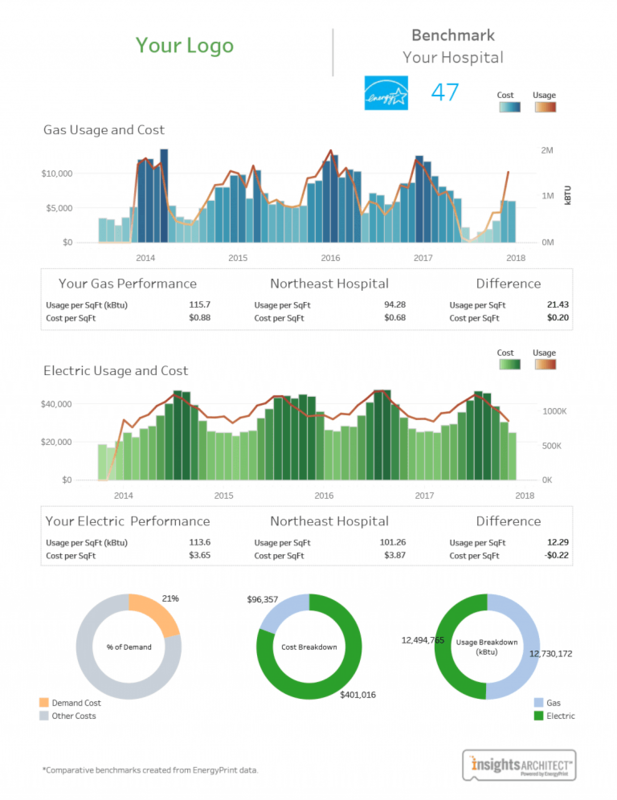 Select from an array of unique and engaging data visualization options. Deliver a branded, professional report that is engaging and easy to understand. Spend less time gathering and analyzing data, and more time talking to your clients or business leaders about energy solutions equipped with a professional energy benchmarking report. Grow your business by focusing on what you do best, and let us put together a professional report based on your input. Build credibility as a trusted energy solutions provider by using utility data to prove cost justification for project improvements. Go above and beyond with added value like weather normalization, ENERGY STAR and other data integrations. We’ll input and validate 12+ months of historical utility bill data required to benchmark a building. Spend less time analyzing data and more time talking to prospects and proposing your energy solutions. Fast turnaround time for reports helps move projects to close quickly. Compare a prospect’s building to other like-type buildings from our leading industry database to understand how the building is performing. Select from a number of robust, yet simple reports that are easy to understand and can be branded for your company. Provide your clients with a professional and engaging takeaway. Visualize a building's avoided costs over time regardless of weather, illustrating the true value of an energy savings project. 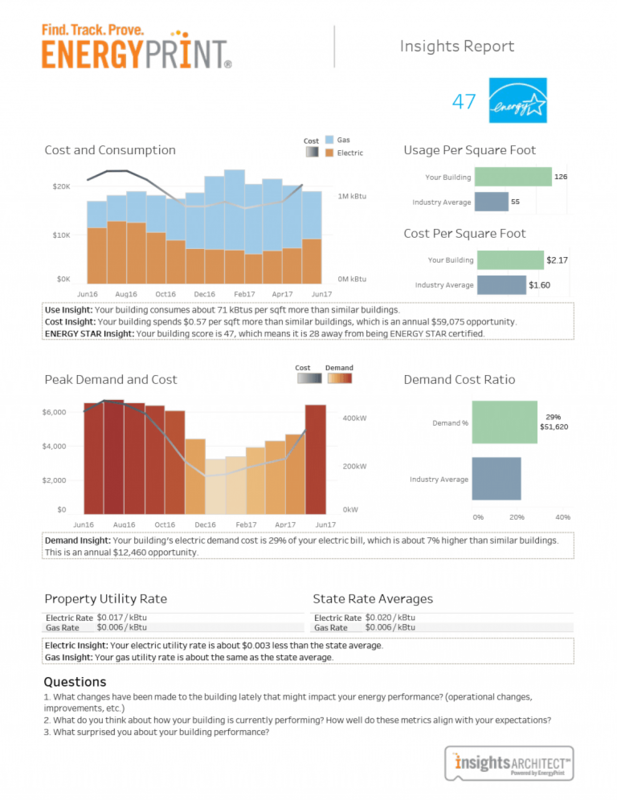 Get a preliminary ENERGY STAR score, or compare to CBECS. 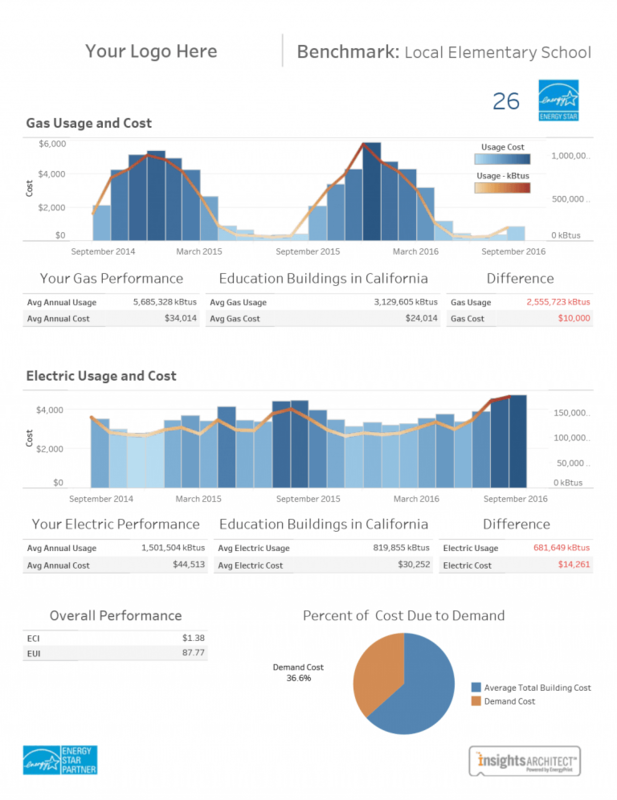 Deliver ECI (Energy Cost Intensity) or EUI (Energy Use Intensity) metrics.